Finally a clear night. Of course the moon was very bright. 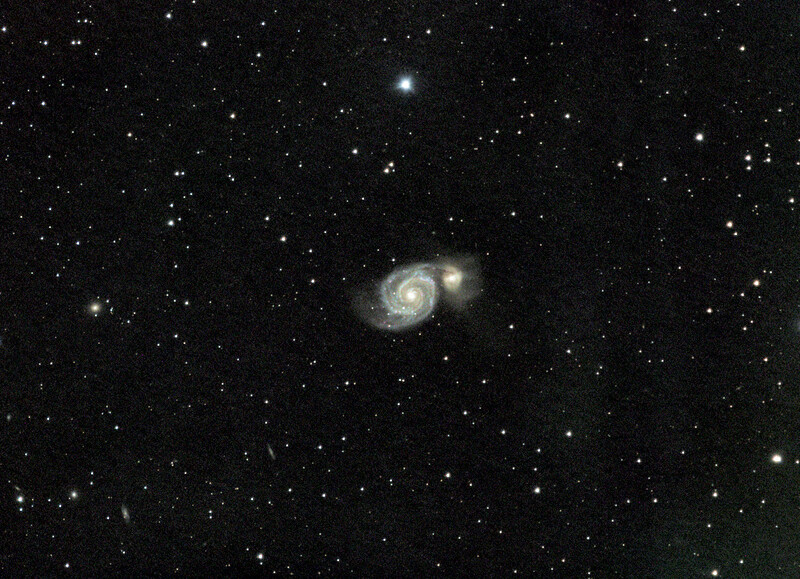 M51 taken with atik 314l+ mono on WO/star 71 with atlas az/eq-g.
That took care of it thanks so much. I tried again today with logs enabled. Could I have a wrong setting? I had this same issue happen this morning using kstars 3.2.0 from a nightly build. Unfortunately I did not have logs enabled. No. All it displays is "Detected Astrometry.net version, da" whereas in Ubuntu Mate on another computer it displays "Detected Astrometry.net version 0.73"
Running Kstars 3.1.0 on Arch linux with astrometry.net version 0.76. Opening the alignment tab the message Detected Astrometry.net version, da is displayed. Ekos then sets the astrometry option to --no-fits2fits. which does not apply to version 0.76. Is there a way to disable this option permanently instead of changing each time I open Ekos? M33 using William optics Star 71, Atlas AZ/EQ-G and Atik 383l+ . Processed with Astro Pixel Processor.